“… in the fifth year, on the seventh day of the month, at the time the Chaldeans took Jerusalem and destroyed it with fire”. “The fifth year referred to is not the fifth year after the destruction of Jerusalem, but the fifth year of the exile of Jeconiah [Jehoiachin], i.e., the fifth year of Zedekiah”. Rev. A. Fitzgerald (F.S.C. ), writing his commentary on “Baruch” for The Jerome Biblical Commentary, appears to me to have made a pretty good fist of pinning down, to 593 BC (conventional dating used in this article for convenience), the year when Baruch wrote his book, or scroll, “on the seventh day of the month in the fifth year after the Babylonians captured Jerusalem” (Baruch 1:2) – 593 BC being the fifth year of king Zedekiah, when the Temple was still standing. On the tenth day of the month of Sivan, Baruch took the sacred utensils which had been carried away from the Temple and returned them to Judah. These were the silver utensils which Zedekiah son of King Josiah of Judah had ordered made after King Nebuchadnezzar of Babylonia had deported Jehoiachin, the rulers, the skilled workers, the nobles, and the common people and had taken them from Jerusalem to Babylon. As 1:1b-2a stand, they indicate that the prayer [of Baruch] was composed “in Babylon, in the fifth year, on the seventh day of the month”. The absence of a number before “month” is strange, but it is generally agreed that the fifth month is intended …. The fifth year referred to is not the fifth year after the destruction of Jerusalem, but the fifth year of the exile of Jeconiah [Jehoiachin], i.e., the fifth year of Zedekiah. Another fifth year with no month given is found in Ez 1:2. Here clearly 593, the fifth year of Zedekiah is the date indicated. If Jer 28:1-3 and 29:1-2 are the source of the incident recounted in 1:8 about the return of the silver vessels, we have another reason for understanding the date of 1:2 as 593 (Jer 28:1). In any case, such an understanding of the problem presented by 1:2b harmonizes perfectly with the rest of the introduction. In the fourth year of Jehoiakim son of Josiah king of Judah, this word came to Jeremiah from the Lord: ‘Take a scroll and write on it all the words I have spoken to you concerning Israel, Judah and all the other nations …’. …. So Jeremiah called Baruch son of Neriah, and while Jeremiah dictated all the words the Lord had spoken to him, Baruch wrote them on the scroll. Whilst the 4th year of king Jehoiakim of Judah is a most crucial biblico-historical date, combining as it does in Jeremiah 25:1 the biblical fourth year of a king of Judah with the first year of a known secular ruler: “The word came to Jeremiah concerning all the people of Judah in the fourth year of Jehoiakim son of Josiah king of Judah, which was the first year of Nebuchadnezzar king of Babylon” – not to mention a date from Jeremiah’s own prophetic career (v. 3): ‘For twenty-three years—from the thirteenth year of Josiah son of Amon king of Judah until this very day—the word of the Lord has come to me and I have spoken to you again and again, but you have not listened’, I think that this date may need to be – in the case of Jeremiah 36:1 – amended to read the fourth year of Zedekiah. Thus, instead of the traditional year of c. 605 BC for the 4th year of Jehoiakim, I think that we are in reality, for Jeremiah 36:1, in the year c. 594 BC, the fourth year of Zedekiah. [E.g., different versions of Scripture present, now Jehoiakim, now Zedekiah, for Jeremiah 27:1]. So, when immediately after 36:1, in Jeremiah 36:4, “Jeremiah called Baruch son of Neriah, and while Jeremiah dictated all the words the Lord had spoken to him, Baruch wrote them on the scroll”, we are now moving speedily towards our very starting point of 593 BC which greets us again in v. 9, “In the ninth month of the fifth year … ”. But not only our same year, because the “ninth month” referred to here just happens to be the very same month, Sivan, as that referred to when Baruch returned the sacred vessels to Judah. After the king burned the scroll containing the words that Baruch had written at Jeremiah’s dictation, the word of the Lord came to Jeremiah: ‘Take another scroll and write on it all the words that were on the first scroll, which Jehoiakim king of Judah burned up’. …. Baruch 5:9 and 6:1-72 actually comprises: “A copy of the letter which Jeremiah sent to those about to be led captive to Babylon by the king of the Babylonians, to tell them what he had been commanded by God”. This is the word that came to Jeremiah from the Lord in the tenth year of Zedekiah king of Judah, which was the eighteenth year of Nebuchadnezzar. The army of the king of Babylon was then besieging Jerusalem, and Jeremiah the prophet was confined in the courtyard of the guard in the royal palace of Judah. And, once again, the restricted prophet is dependent upon the aid of Baruch. And once again we find the king, too, now Jehoiakim, now Zedekiah – but my argument is that it were all just Zedekiah – berating the prophet Jeremiah for his pessimistic predictions. Also tell Jehoiakim king of Judah, ‘This is what the Lord says: You burned that scroll and said, “Why did you write on it that the king of Babylon would certainly come and destroy this land and wipe from it both man and beast?” Therefore this is what the Lord says about Jehoiakim king of Judah: He will have no one to sit on the throne of David; his body will be thrown out and exposed to the heat by day and the frost by night. I will punish him and his children and his attendants for their wickedness; I will bring on them and those living in Jerusalem and the people of Judah every disaster I pronounced against them, because they have not listened’. Everything that Jeremiah, with the assistance of Baruch, had prophesied or proclaimed to the king and his officials, and to the people of Judah, would soon be fulfilled. For, the very next year, Jerusalem and its Temple fell to the Babylonians. And the king was taken into captivity. And on the ninth day of the fourth month of Zedekiah’s eleventh year, the city wall was broken through. Then all the officials of the king of Babylon came and took seats in the Middle Gate: Nergal-Sharezer of Samgar, Nebo-Sarsekim a chief officer, Nergal-Sharezer a high official and all the other officials of the king of Babylon. When Zedekiah king of Judah and all the soldiers saw them, they fled; they left the city at night by way of the king’s garden, through the gate between the two walls, and headed toward the Arabah. But the Babylonian army pursued them and overtook Zedekiah in the plains of Jericho. They captured him and took him to Nebuchadnezzar king of Babylon at Riblah in the land of Hamath, where he pronounced sentence on him. There at Riblah the king of Babylon slaughtered the sons of Zedekiah before his eyes and also killed all the nobles of Judah. Then he put out Zedekiah’s eyes and bound him with bronze shackles to take him to Babylon. In the fifth month, on the seventh day of the month—that was the nineteenth year of King Nebuchadnezzar, king of Babylon—Nebuzaradan, the captain of the bodyguard, a servant of the king of Babylon, came to Jerusalem. And he burned the House of the Lord and the king’s house and all the houses of Jerusalem; every great house he burned down. And all the army of the Chaldeans, who were with the captain of the guard, broke down the walls around Jerusalem. When Jeremiah had finished telling the people all the words of the Lord their God—everything the Lord had sent him to tell them — Azariah son of Hoshaiah and Johanan son of Kareah and all the arrogant men said to Jeremiah, “You are lying! The Lord our God has not sent you to say, ‘You must not go to Egypt to settle there.’ But Baruch son of Neriah is inciting you against us to hand us over to the Babylonians, so they may kill us or carry us into exile to Babylon”. The next is the last that we hear of Baruch, whose combined floruit in the books of Jeremiah and Baruch I have estimated to have been only about (593-587 =) 6 years – depending on when the exile to Egypt occurred (Jeremiah 43:6-7): “And they took Jeremiah the prophet and Baruch son of Neriah along with them. So they entered Egypt in disobedience to the Lord and went as far as Tahpanhes”. So, what happened to Baruch after that? Was the young Elihu of the Book of Job (ch’s 32-37), as according to some, an enlightened prophet whose input is crucial to the dialogue, providing a “bridge” between Job and God, or, as according to Mason, “… an astonishingly pompous little windbag. He takes the entire first chapter, for example, plus portions of the second, simply to clear his throat and announce that he has something to say.”? Do you remember the last character in the book of Job? Elihu is his name. He was not one of Job’s friends. He was simply listening to Job’s friends judging him and Job defending himself. As he began to listen to all four, God gave him insight into the true nature of Job’s sufferings. Out of all the human characters, only Elihu understood why Job suffered. It is amazing that I haven’t heard anyone ever mention Elihu. We almost forget him. But the truth is, Elihu was the only one with true insight, not only into the sufferings of Job but, insight into the sufferings of all mankind. This is why Elihu is the last to speak concerning Job’s sufferings. It is interesting to note that when God appeared to Job, He rebuked Job for not having insight and He rebuked Job’s three friends for falsely judging Job. Yet God never rebuked Elihu. Why? Because Elihu was correct in understanding suffering. Notice, Elihu is about to give wisdom not because of any human understanding, but because God’s Spirit gave him understanding. The first thing he does is correct Job’s friends. Elihu showed Job’s friends that they were wrong in judging him. The second thing Elihu does is correct Job, but he does it in humility. Elihu saw one fundamental flaw in Job: that Job believed that he was without original sin. Job was self-righteous. Yes, he was righteous as far as men are concerned, but he was not righteous as far as God was concerned. Since Job thought he was sinless and not under the curse of sin, he could not figure out how he could suffer. This bothered Job. But Elihu points out the fact that Job was a sinner like everyone else and is subject to the curse of sin which includes sickness and poverty. People erroneously think that the book of Job was written to try to answer the question: Why does God allow good people to suffer? But Elihu has no trouble with that question because he knows that there are no truly “good” people in God’s sight. The thing that perplexed Elihu was not the fact that Job was suffering, but why weren’t he and Job’s friends suffering along with Job. In fact, Elihu is wondering why everyone doesn’t suffer all the time since everyone is a sinner. Elihu realized that sinners are under the curse of sin, and therefore have no legal right to get mad when they suffer. They should realize that they deserve to suffer and if they are not suffering, they should praise God even more because He is having mercy on them. Elihu asked the right question, “Why does God allow sinners to be blessed?” The answer: Because God is merciful. In other words, before Job had his trials, he experienced the mercy of God. But when Job had his trials, he experienced the justice of God–he only got what he deserved. 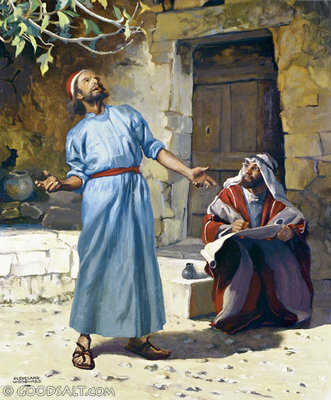 Immediately after Elihu spoke, God answered Job in a whirlwind and rebuked him for falsely accusing God of injustice. Job wisely repented. …. Despite all the good that might be said of Elihu, the fact remains that he really is an astonishingly pompous little windbag. He takes the entire first chapter, for example, plus portions of the second, simply to clear his throat and announce that he has something to say. Two quite contrasting views here, Elihu a man of ‘true insight’ (Brown), Elihu ‘a pompous little windbag’ (Mason)! Now comes the part of the whole story that is my personal favorite, at least my favorite character. You see, sitting back and listening to everything that was being said was a young man named Elihu. He was never mentioned before, probably because he was too young to be noticed. But once he starts talking, there is no doubt he possessed a spiritual discernment unknown by the others. Ezekiel refers to this “heat of the Spirit” when the Lord had moved him to speak. Jeremiah spoke of God’s word being “in his heart like a burning fire” and being “weary of holding it in. Indeed (he) could not” (Jeremiah 20:9). When “the Sovereign Lord has spoken, who can but prophesy” (Amos 3:8)? “Woe to me, if I do not . . .” (I Corinthians. 9:16). Who could blame Elihu? Here he was sitting there as he saw Job becoming more and more concerned about clearing his own character than justifying the love and character of God. He also watched as his elders condemned Job without mercy and never were able to find an answer to Job’s complaints or to explain to him God’s purpose. Elihu realizes that he is in a very delicate position for a young man. How is he going to speak to these dignified seniors? He holds himself back, waits and watches for the right moment. If indeed the Spirit of God has chosen him to be the “interpreter,” he will wait until He opens the way for him. So finally, there’s a pause. The friends “stopped answering Job” and “the words of Job are ended.” The Lord’s message comes to Elihu and he obediently speaks. He takes from the beginning a place of humility and acknowledges his youthfulness and confesses how he had shrunk from saying what was on his heart because of their age and his respect for them. He knows there’s “a spirit in man,” and that it’s “the breath of the Almighty” alone that gives understanding and not age or position. So he is going to be obedient to the Lord and boldly say “Listen to me” although he is young. After all that, Elihu pauses almost as if he was waiting for some kind of encouragement from them or something. But they just sit there. “You sit there baffled and embarrassed with no more replies. Should I just sit here and wait because you haven’t said anything?” No, he must be faithful to God regardless of their silence. He has to fulfill his “part” in God’s purpose and give the light that has been given to him. …. Elihu, who must have been – according to my reconstructions of the life of the righteous Job – a contemporary of the prophet Ezekiel, is found to have “similarities” with that prophet. Job’s long life during the neo-Assyrian era took him at least as far as the destruction of Nineveh (c. 612 BC, conventional dating). This would mean that Elihu, a young man when Job was already old, had lived during the Chaldean era. And the Chaldean era was, of course, the very era during which the prophet Ezekiel had lived and prophesied. There are several similarities between Elihu and Ezekiel. Comparisons include whirlwinds; sitting for seven days; not speaking; and rebuking elders even though they themselves were much younger. IN LAST MONTH’S article we considered Elihu and Elijah. In this second article we consider Elihu and Ezekiel. As in the previous study, a whirlwind plays an important role. In the opening chapter of Ezekiel we read of a whirlwind: “And I looked, and, behold, a whirlwind came out of the north, a great cloud, and a fire infolding itself, and a brightness was about it, and out of the midst thereof as the colour of amber, out of the midst of the fire” (v. 4). Just as the speech of Elihu was terminated by a whirlwind, the first vision that Ezekiel sees begins with a whirlwind. In Job the whirlwind provided a demonstration of power out of which God spoke. The whirlwind in Ezekiel is spoken of in more detail, and from it emerge the cherubim. When Job’s friends came to him (and we know that Elihu was also there) we read, “So they sat down with him upon the ground seven days and seven nights, and none spake a word unto him: for they saw that his grief was very great. After this opened Job his mouth, and cursed his day” (2:13; 3:1). Likewise, Ezekiel spent a period of seven days simply sitting with a group of people, apparently saying nothing—at least, not words from God: “Then I came to them of the captivity at Tel-abib, that dwelt by the river of Chebar, and I sat where they sat, and remained there astonished among them seven days. And it came to pass at the end of seven days, that the word of the LORD [Yahweh] came unto me, saying . . .” (Ezek. 3:15,16). In Job 21:5 Job says, “Mark me, and be astonished, and lay your hand upon your mouth”. Ezekiel later follows in the spirit of Job’s request, being “astonished”, and effectively having his hand upon his mouth. Yet, in the case of Job, all the time Elihu was indeed laying his hand upon his mouth, no doubt humble enough to be astonished too. As we read the speeches of Job and his three friends, the presence of Elihu can be felt. We know that he is there listening, but he restrains himself from speaking: “And Elihu the son of Barachel the Buzite answered and said, I am young, and ye are very old; wherefore I was afraid, and durst not shew you mine opinion” (32:6). He was voluntarily dumb, a dumbness out of respect and fear for his elders, on the basis that “Days should speak, and multitude of years should teach wisdom” (v. 7). Ezekiel was also to be silent, speaking only when God caused him to speak. But his silence, unlike Elihu’s, was miraculously enforced, for he was made dumb: “and I will make thy tongue cleave to the roof of thy mouth, that thou shalt be dumb, and shalt not be to them a reprover: for they are a rebellious house. But when I speak with thee, I will open thy mouth, and thou shalt say unto them, Thus saith the Lord GOD [Yahweh]; He that heareth, let him hear; and he that forbeareth, let him forbear: for they are a rebellious house” (Ezek. 3:26,27). Ezekiel was made dumb because the house of Israel were rebellious. In contrast, after Elihu and God had spoken, Job showed humility towards God and repented “in dust and ashes” (Job 42:6). “And it came to pass in the seventh year, in the fifth month, the tenth day of the month, that certain of the elders of Israel came to enquire of the LORD [Yahweh], and sat before me” (20:1); “Son of man, speak unto the elders of Israel, and say unto them, Thus saith the Lord GOD [Yahweh]; Are ye come to enquire of Me? As I live, saith the Lord GOD [Yahweh], I will not be enquired of by you” (v. 3). In the case of both the friends of Job and the elders of Judah, old age proved to be no guarantee of wisdom or obedience. Their rebuke by younger men only served to heighten their folly. [Mackey’s comment: In the following section, Bernard, whilst continuing to find similarities between Elihu and Ezekiel, will distinguish between “Ezekiel … the priest” and “Elihu … not a priest”. Whether or not Elihu was a priest has yet, I think, to be determined]. Ezekiel is described as “the priest, the son of Buzi”. That he was both a priest and the son of Buzi provides a link with Elihu. Malachi wrote that “the priest’s lips should keep knowledge” (2:7). Although not a priest, Elihu sought to live the spirit of these words, for he said, “my lips shall utter knowledge clearly” (Job 33:3). Elihu is said to be “the son of Barachel the Buzite, of the kindred of Ram” (32:2). That Elihu was a Buzite could mean that he was a descendant of Buz, the son of Nahor (see Gen. 22:20,21), and/or he lived in a territory called Buz. According to Strong, “Buzi” in Ezekiel 1:3 is the same word as “Buzite” in Job 32:2. This is a rare name in Scripture. That both Elihu and Ezekiel have this name mentioned in their ancestry alerts us to look for other similarities between these two men. There are other significant connections between the book of Job and Ezekiel, which, although not relating directly to Elihu, form an important background to the links we have seen. For example, some aspects of the cherubim reflect the words used by God of creation in His speech to Job. God asks Job, “Canst thou send lightnings, that they may go, and say unto thee, Here we are?” (Job 38:35). In Ezekiel it is said of the cherubim, “and out of the fire went forth lightning” (1:13). God also asks Job, “Doth the hawk fly by thy wisdom, and stretch her wings toward the south?” (Job 39:26). The Hebrew word for “hawk” is related to the word translated “sparkled” in Ezekiel 1:7, where it is stated that the feet of the cherubim “sparkled like the colour of burnished brass”. As the hawk flew swiftly south, it did so with a flashing brilliance, sparkling against the sun. As such, as the cherubim came sparkling from the north, it was like the hawk flying toward the south. The Hebrew word Shaddai occurs forty-eight times in the Bible and is always translated ‘Almighty’. It is a key word in Job, occurring thirty-one times. It is used only four times in all of the prophets: once in Isaiah, once in Joel, and twice in Ezekiel. It is significant that a key word in Job, so rare in the prophets, should occur twice in Ezekiel. Of course, Job is actually mentioned in Ezekiel: “though these three men, Noah, Daniel, and Job, were in it, they should deliver but their own souls by their righteousness, saith the Lord GOD [Yahweh]” (14:14). Furthermore, the phrase “these three men” is itself taken, ironically, from the book of Job, ironic because here it refers to the three friends of Job, who were delivered as a consequence of the prayer of Job: “So these three men ceased to answer Job . . .” (32:1). [Mackey’s comment: How fascinating! Bernard is perfectly correct here. The exact same Hebrew phrase (שְׁלֹשֶׁת הָאֲנָשִׁים הָאֵלֶּה), “these three men”, is found in both Ezekiel 14:14 and Job 32:1]. As we have seen in this and the previous article, there are several connections between Elihu and the two prophets Elijah and Ezekiel. As well as helping us to understand the work of Elijah and Ezekiel, these comparisons also help us to see Elihu in a new light, supporting the view, in my opinion, that Elihu’s speech was vital for preparing the mind of Job for when God would speak to him. Buzites, they experienced similar awesome theophanies, and were filled with God’s spirit. Many Bible interpreters disavow what Elihu has to say in the Book of Job. Below I will give a few reasons why I believe his speech to Job is true and is good theology. 2) There is a break in the text to introduce him. The words of Elihu in Job 32:1-3 are not continuing what the other three friends have said, but stating something new. There is a break in the text that introduces something new. Elihu should not get lumped into the group of the other three friends with bad theology. 3) Six chapters are given to Elihu in the Book of Job. The writer of this Book devotes six chapters to Elihu. With much space given to Elihu, surely there is some importance to it. 4) Elihu shows how Job’s other friends are wrong. God also rebuked Job’s other three friends. 6) Elihu signals Gods coming to speak. In 37:11-12 Elihu is describing a whirlwind and attributes the whirlwind to God. We see just a few verses later that God is answering Job out of the whirlwind. Verse one in chapter 38 states, “Then the Lord answered Job out of the whirlwind.” Notice the writer of this book did not say “A” whirlwind. But he says, “THE” That means that there must have been a whirlwind that was taking place, that had already been mentioned previously in the Book of Job. All throughout Elihu’s speech we see him referring to nature. I believe that Elihu is referring to what was actually taking place in front of Job and his three friends. He is describing what was going on while also signaling that God is coming to speak. What do you think? …. Well, to answer Block here, I, for my part, “think” that Elihu was definitely a Jeremiah type, a prophetic messenger sent by God, wholly aflame with the spirit of God, full of eloquence yet humble and modest, and young at the same time that Jeremiah was young. It’s pleasant to notice Elihu’s modesty and tact in entering the discussion with his elders. It says that his “wrath was kindled” against Job and the three friends. This is explained later when he talks about the constraining of the Spirit within him, so that he was “ready to burst. …. Jeremiah spoke of God’s word being “in his heart like a burning fire” and being “weary of holding it in. Indeed (he) could not” (Jeremiah 20:9). But, if I should have to choose a biblical alter ego for Elihu, my preference – based on what we have read in Part One and Part Two – would be for the prophet Ezekiel, rather than Jeremiah. “Ezekiel [too] refers to this “heat of the Spirit” when the Lord had moved him to speak”. “Elihu [was the] son of Barachel the Buzite, of the family of Ram” (Job 32:2). “Ezekiel [was] the priest, the son of Buzi …” (Ezekiel 1:3). We now know that Elihu and Ezekiel were contemporaries. They also have in common the rare name, Buzi: “According to Strong, “Buzi” in Ezekiel 1:3 is the same word as “Buzite” in Job 32:2. This is a rare name in Scripture. That both Elihu and Ezekiel have this name mentioned in their ancestry alerts us to look for other similarities between these two men”. Elihu says (Job 33:1): ‘But now, Job, listen to my words; pay attention to everything I say’. Ezekiel twice has God proclaim (Ezekiel 14:14, 20): ‘… even if these three men—Noah, Daniela and Job—were in it, they could save only themselves by their righteousness …’. And most strikingly in relation to this situation we learned that: “The exact same Hebrew phrase (שְׁלֹשֶׁת הָאֲנָשִׁים הָאֵלֶּה), “these three men”, is found in both Ezekiel 14:14 and Job 32:1. Then in Part Two, we further learned of a whole variety of parallels and links between Elihu and Ezekiel, for example: “Comparisons include whirlwinds; sitting for seven days; not speaking; and rebuking elders even though they themselves were much younger”. Nigel Bernard, who had provided us with some of the best of these likenesses, did, however, distinguish “Ezekiel … “the priest, the son of Buzi”. That he was both a priest and the son of Buzi provides a link with Elihu. Malachi wrote that “the priest’s lips should keep knowledge” (2:7)” from Elihu: “Although not a priest, Elihu sought to live the spirit of these words, for he said, “my lips shall utter knowledge clearly” (Job 33:3)”. To which I had attached this comment: “Whether or not Elihu was a priest has yet, I think, to be determined”. The prophet Ezekiel was most definitely a priest, as is clear from 1:3: “Ezekiel the priest …”. So, in order even to consider whether or not Elihu and Ezekiel could be the same person, one would need to be able to show that Elihu’s genealogy (the only one given in the Book of Job) (32:2): “… son of Barachel the Buzite, of the family of Ram”, was Levite. Given that this is the only reference in the Bible to the name Barachel, the task is a difficult one. Moreover, the phrase “of the family of Ram” (מִמִּשְׁפַּחַת-רָם), has led some to the conclusion that young Elihu was an Aram(= Ram)ite, i.e., of the Syrian race. However, the Hebrew phrase rendered here invariably refers to “family”, rather than to race. Elihu, who, as we found, is very much in the mould of the prophet Ezekiel, his contemporary – so much so that I think he may even be this Ezekiel – similarly shares some close likenesses with the ancient prophet Elijah. THERE ARE several comparisons that can be made between Elihu and the prophets Elijah and Ezekiel. A consideration of these comparisons increases our understanding both of the work of the prophets and of the importance of Elihu. …. We begin by considering the similarity of the names of Elihu and Elijah. Elihu and Elijah are very similar in spelling and occur next to each other in the concordance. Their meanings are also very similar, both incorporating the Hebrew word ’el. Elihu means ‘My God is He’ and Elijah means ‘My God is Yah’. The proper name [אֱלִיהוּא] means “He is my God” or “My God is He.” The latter is adopted by E. W. Bullinger (The Book of Job [Grand Rapids: Kregel, 1990], 161). Elihu is similar to the name Elijah, “Yahweh is my God.” Elihu’s name bears witness to [El] as the highest God. Elihu’s name may even be “an expression of his theological program”: It is Yahweh who speaks through his speeches. Wisdom says that as it turned out, “the message epitomized in his name became an integral part of Elihu’s message to Job (e.g., 33:12-13; 34:18-19, 23, 31-32; 35:2-11; 36:26; 37:22-24)” (Thurman Wisdom, “The Message of Elihu: Job 32-37,” Biblical Viewpoint 21 : 29). Elihu’s identity is also connected with three other names, Barachel, Buz, and Ram. Elihu is therefore the only character in the book with a recorded genealogy, which “may point to his aristocratic heritage” (Robert L. Alden, Job, New American Commentary [Nashville: Broadman and Holman, 19931, 316; also see David McKenna, Job [Dallas, TX: Word, 19821,225). The end of the record concerning both men is marked by a whirlwind. Following the closing words of Elihu it is written, “Then the LORD [Yahweh] answered Job out of the whirlwind, and said . . .” (Job 38:1). Of Elijah it is written, “And it came to pass, as they still went on, and talked, that, behold, there appeared a chariot of fire, and horses of fire, and parted them both asunder; and Elijah went up by a whirlwind into heaven” (2 Kgs. 2:11)…. Both Elihu and Elijah emphasised the role of rain in the purpose of God. In Job 36 Elihu said, “For He maketh small the drops of water: they pour down rain according to the vapour thereof: which the clouds do drop and distil upon man abundantly” (vv. 27,28). In 37:6 he says, “For He saith to the snow, Be thou on the earth; likewise to the small rain, and to the great rain of His strength”. And later on in the chapter Elihu says, “Also by watering He wearieth the thick cloud: He scattereth His bright cloud: and it is turned round about by His coun­sels: that they may do whatsoever He commandeth them upon the face of the world in the earth. He causeth it to come, whether for correction, or for His land, or for mercy” (vv. 11-13). In 1 Kings 17:1 it is written, “And Elijah the Tishbite, who was of the inhabitants of Gilead, said unto Ahab, As the LORD [Yahweh] God of Israel liveth, before whom I stand, there shall not be dew nor rain these years, but according to my word”. From James 5:17,18 we learn that, not only did Elijah later pray for rain to come (which we read about in 1 Kings 18:41-45), but he had also originally prayed for the rain to stop: “Elias was a man subject to like passions as we are, and he prayed earnestly that it might not rain: and it rained not on the earth by the space of three years and six months. And he prayed again, and the heaven gave rain, and the earth brought forth her fruit”. Elijah would have been mindful that the Law spoke of rain being withheld if Israel sinned: “Take heed to yourselves, that your heart be not deceived, and ye turn aside, and serve other gods, and worship them; and then the LORD’S [Yahweh’s] wrath be kindled against you, and He shut up the heaven, that there be no rain, and that the land yield not her fruit; and lest ye perish quickly from off the good land which the LORD [Yahweh] giveth you” (Deut. 11:16,17). By praying for rain to stop and then come, Elijah was show­ing all three aspects of Elihu’s words concerning rain; how it could be used “for correction, or for His land, or for mercy”. That Christ alludes to both the speech of Elihu and the life of Elijah in Luke 12 reflects the strong link between these two men. The way Christ also seamlessly moves between the speech of Elihu and the speech of God that follows, also provides evidence that Elihu’s words were rightly spoken. The point was made earlier that the Scriptural record concerning both men ends with a whirl­wind. But of course this is not the last we hear of Elijah. Wherever he was taken, he was later to write a letter to Jehoram (see 2 Chron. 21:12-15). And it seems that Elijah was raised from the dead to meet with Christ at the transfiguration. It may also be the case that the whirlwind is not the last we hear of Elihu. In Job 32 Elihu says, “They were amazed, they answered no more: they left off speaking. When I had waited, (for they spake not, but stood still, and answered no more;) . . .” (vv. 15,16). These words sit a little awkwardly in his speech. This can be explained by the suggestion that Elihu was the man who wrote the book of Job and these verses are inspired words of Elihu which he inserted into the record to tell the reader how the friends reacted to him. against Job his anger burned because he justified himself before God”. …. Can they be the same? Then … we further learned of a whole variety of parallels and links between Elihu and Ezekiel, for example: “Comparisons include whirlwinds; sitting for seven days; not speaking; and rebuking elders even though they themselves were much younger”. “… son of Barachel the Buzite, of the family of Ram”. The priest Jehoiada, with whom I am identifying Elisha, was otherwise known as Barachiah, or Berechiah (Matthew 23:35): ‘… on you will come all the righteous blood shed on earth, from the blood of righteous Abel to the blood of Zechariah son of Barachiah, whom you murdered between the temple and the altar’. The name Barachiah was in this case more of a title than a proper name, I suggest, stemming from (and this is where Jehonadab the Rechabite comes in) the Hebrew ben [bar] Rechab. the name, Barachel can be associated with Berechiah. Barachel was not, therefore, Elihu’s direct father, but rather his famous priest-ancestor, Berechiah (= Jehoiada), who I am saying was the prophet Elisha himself. This would mean that Elihu of the Book of Job was actually a priest, thereby strengthening my hopeful equation of Elihu with “Ezekiel the priest …” (Ezekiel 1:3), who was, according to the same verse, “the son of Buzi”. I take this to be, as in the case of Elihu, a geographical indicator – that Elisha was from the land of Buz, not that Ezekiel’s father was called “Buzi”. Was Elisha (Barachel) geographically a Buzite? Unfortunately it is difficult to be definitive about this because geographical details are, at this present stage of our knowledge, somewhat uncertain. Whilst we know from I Kings 19:16, for instance, that “Elisha … [was] from Abel-Meholah ….”, we do not encounter certainty as to the location of this place. It is frequently described as being “unknown”. “… archaeologists have discovered the remains of a house that probably was the house where the prophet Elisha lived. The Bible says that the prophet Elisha was the son of Shaphat and lived in the Israelite city of Abel-meholah (1 Kings 19:16). Elisha was a disciple and the successor of the prophet Elijah. The building that archaeologists believe was the house where the prophet Elisha lived was discovered at the site of Tel Rehov, a few miles from Abel-meholah. According to the Institute of Archaeology of The Hebrew University of Jerusalem, Tel Rehov was “the location of the largest ancient Canaanite and Israelite site in the Beth-Shean Valley and one of the largest tels in the Holy Land.” The site was occupied in the 10th-9th centuries B.C. during the reigns of David and Solomon and during the reigns of Omri and Ahab. to have been the fertile Hauran valley region of Bashan. A location in Gilead would mean that the prophet Elisha hailed from the same land as did “Elijah the Tishbite, from Tishbe in Gilead …” (I Kings 17:1), with whom Elisha was a very close acquaintance – he being Elijah’s chosen disciple. Elihu’s “Ram”, then, must refer to Jeho-Ram, indicating Elihu’s royal connections through his ancestor, the priest Jehoiada (var. Barachel/Elisha).